Events from What Grows On in Rhode Island! 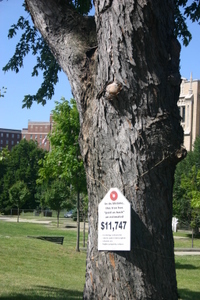 On this first day of summer 2007, Providence's Mayor David Cicilline held a press conference under a giant silver maple (it's 40" in diameter at chest height) at Nathanael Greene Middle School to present the results of last year's Providence street tree tally. 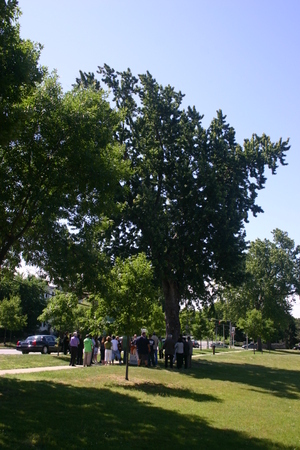 The press release on the city's website gives many of the details, and City Forester Doug Still summarized the key findings of the tree inventory. We (I was one of the 96 volunteers) counted 24,999 trees and identified 95 different species. These trees are valuable in more ways than you might guess. Of course they add beauty, and it's lovely to be in their shade on hot summer days. But trees improve air quality, consume carbon, save $$ spent on electricity and gas for air conditioning, absorb storm water runoff, and increase property values. Doug used a new US Forest Service program, STRATUM, to calculate the value of Providence's STREET trees (this is not including all the trees in parks and private property, just the 25,000 along our 370 miles of city streets) and found that Providence's street trees contribute more than $2.9 million/year in benefits to residents each year. The replacement value of Providence's STREET trees is almost $82 million. Trees, especially mature trees, on your property are valuable, and you should not rush to remove any tree from your property without considering a wide range of factors. In fact, Providence and other towns and cities have ordinances that protect some trees on private property.